This article refers to the South Korean basic trainer. For the Chinese commercial launch vehicle also known as KT-1, see Kaituozhe-1. The KAI KT-1 Ungbi (Hangul: KT-1 웅비) is a Korean single-engined turboprop, basic training aircraft. It was jointly developed by KAI and the Agency for Defence Development (ADD). The KT-1 is the first completely indigenous Korean aircraft ever developed. Development was initiated under the KTX program for the Republic of Korea Air Force in 1988 using the CATIA computer program to completely develop the aircraft, the first of its class. Nine prototypes were built on June 1991 with the first flight of the KT-1 occurring on November 1991 for static and fatigue testing. In 1995, the project was officially named 'Ungbi'. In 1998 the final test flight was performed. In 1999, a contract was signed for eighty-five aircraft with provisions for an additional twenty between Korea Aerospace Industries and the Republic of Korea. 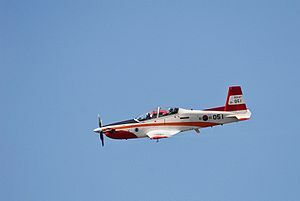 The first KT-1 Ungbi was handed over to the Republic of Korea Air Force in 2000 with the delivery of the eighty-five aircraft being completed in 2002. KT-1 can be equipped with either an analog or 'glass' cockpit configuration. Both types are employed by the Republic of Korea Air Force. In terms of appearance, the KT-1 is visually reminiscent of the Pilatus PC-9. KAI exported seven planes plus spare parts to Indonesia in April 2003 under a 60 million USD contract, and five more in May 2005. In a recent press release held in Sacheon, South Korea on March 8, 2006, KAI stated that it will export more than 150 improved versions of the KT-1 to various countries in Central America and Southeast Asia. The improved export version of the KT-1 will be called KT-1C. As of June, 2007, South Korea and Turkey have successfully negotiated for a contract of exporting 40(+15) KT-1, as well as modular armor technology of K2 Black Panther for Turkey's future indigenous MBT, to Turkey for KRW₩500,000,000,000 (approximately USD$540,000,000). A statement published by Cheong Wa Dae, the South Korean Presidential website, on 26 January 2010, said that India and South Korea had agreed, as part of upgrading their partnership to a 'strategic relationship', form a joint committee in the first half of 2010. The statement added that this committee will facilitate an offer from Seoul to supply up to 60 KT-1 trainers to meet Indian Air Force requirements. KTX-1 Yeo-Myung Prototype primary trainer each with a different engine fitted, six built. Picture - A KA-1 at Osan Air Base, 2010. KA-1 An armed advanced trainer with light attack and forward air control capabilities. Several new features unique to the KA-1 are head-up-display and up-front control panel, MFD panels, five hardpoints, two under each wing and one under the fuselage. The hardpoints maybe be equipped with rocket launcher, gun pods or AIM-9 Sidewinder missiles. KT-1B Export version for Indonesia. KT-1C Improved, armed export version equipped with a centreline Forward looking infrared pod. The KT-1C may also be equipped with a 12.7mm gun pod, chaffes, flares, training missiles, rockets or unguided bombs. KT-1T Export version for Turkey. KAI KT-1 Pictures and KAI KT-1 for Sale.